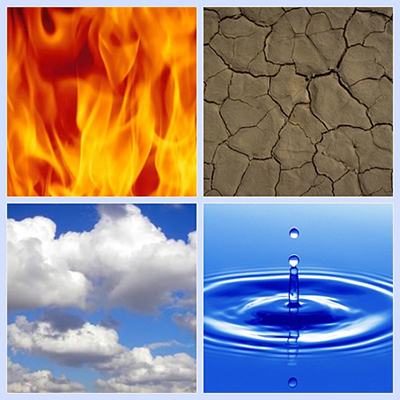 The Four Elements (Earth, Water, Wind, Fire) encompass natural processes observed in Earth’s broader ecosystem. These elements are often referenced through various Martial Arts (normally accompanied by a fifth heading of void). The movements and techniques based on these elements were adapted from the natural environment in a way that affords a different perspective on the personal ecosystems of martial artists against the backdrop of Earth’s broader ecosystem. In addition to the physical aspects of elemental techniques and related movements, human personality types are associated with one primary and one secondary element. One element is also identified as more contrary to the basic nature of a specific personality type. A dynamic balance of the four elements is present in each person. The balance is not permanent and dynamically varies in time. The idea of elements is comparable to ecosystems or ecosystem processes controlled by a primary element. Image 3 contains four images of the fundamental elements, with Fire in the top left, Earth in the top right, Wind in the bottom left, and Water in the bottom right. The last element, Void, acts as the space in the image.